I've known for years that I liked the work of Jacob Lawrence. I've had the pleasure of viewing a few works in person, and his vivid color and bold graphic style comprise the type of imagery I strongly identify with, referred to as "dynamic cubism." When finding images for this post, however, I was literally blown away by the visual power of his body of work. This artist, deeply influenced by the colors and shapes of Harlem, is truly an American treasure. I have moved from "liking" to "loving." 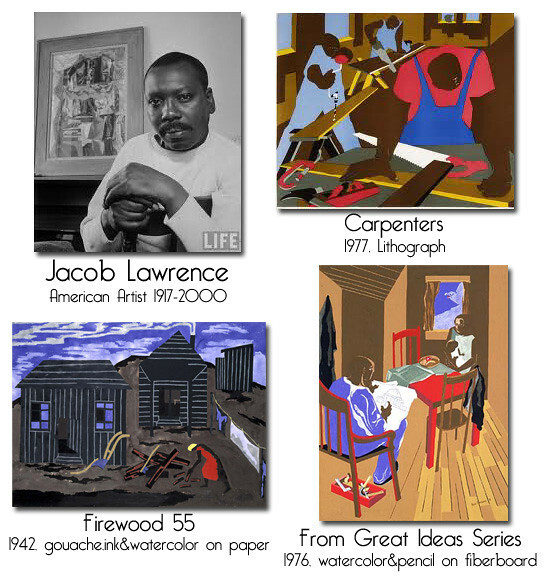 There are a few artists I will be obsessed with all of my creative life, and Jacob Lawrence has become one of them. Lawrence was not only an incredibly talented artist, recognized at sixteen by artist Charles Alston, who taught at the Harlem Art Workshop, but he was a man of remarkable character. His work isn't known for depicting debauchery, like many other artists, but rather for bringing national attention to important periods in African-American history. When Lawrence attended school, African-American history was not a subject seriously pursued. 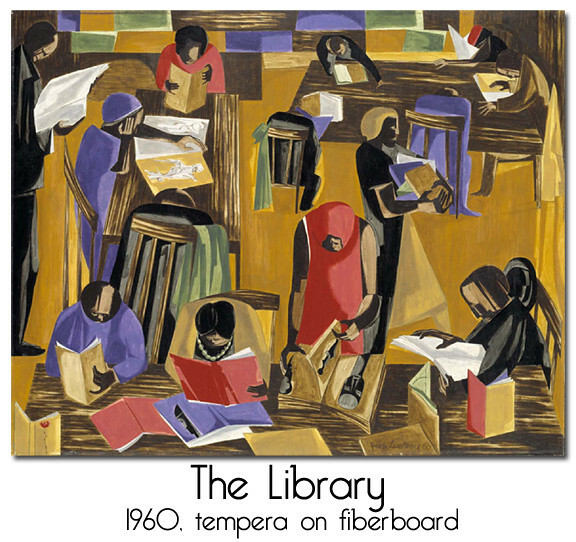 He created "The Library" to depict the crowded rooms in libraries where he would have to actively research information about his heritage. By the time he was 23, he had already created an impressive body of work, including multiple series of paintings featuring important historical figures like Frederick Douglas and Harriet Tubman. His sixty-panel set of paintings entitled "The Migration Series," depicting the migration of hundreds of thousands of African-Americans from the South to the North after World War I, led him to national fame. The work is powerful and deeply moving. 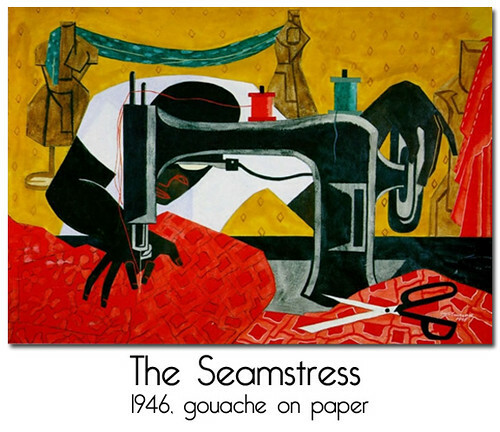 The compositional rhythm and vibrant colors in "The Seamstress" create such a beautiful picture. This is one of my favorite pieces! You can appreciate Lawrence's work from a completely aesthetic viewpoint, let alone knowledge of the history behind the images. That is what makes him an artistic genius! Having attained national fame for his work, Lawrence still decided to bravely serve his country in October of 1943, when he enlisted in the United States Coast Guard and served with the first racially integrated crew on the USCGC Sea Cloud. In 1970, the NAACP awarded this admirable artist with the Spingarn Medal to recognize a life of outstanding achievements as a artist, teacher and humanitarian. The list of other recipients of this medal is astounding! When Lawrence died in 2000, he was hailed by the New York Times as "One of America's leading modern figurative painters," and "among the most impassioned visual chroniclers of the African-American experience." He is truly an artist to be admired and greatly respected. I love the hot and cold colors and the way they make each other POP! I can see why you love him! Thanks for this glimpse Erin. Astonishing that I'd never heard of Jacob Lawrence before. His work is just so rich and stunning!